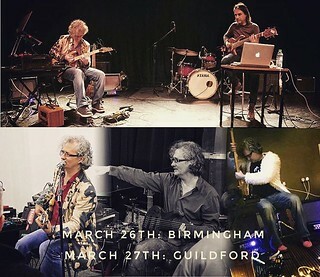 Last Two Gigs on My March Tour – Birmingham and Guildford. The last two shows on my slightly spread out tour are a week away – Sunday 26th is back at Tower Of Song in Birmingham (ticket link) with drum genius, Andy Edwards (Robert Plant, Frost*, IQ, Magenta, Kiama etc. etc.) and then the day after, March 27th, I’m in Guildford (ticket link) doing an ‘Illuminated Loops’ show with artist Poppy Porter – SO excited about both of these gigs. 2017 is getting REALLY exciting for music – more gigs are coming up, I’ve got two collaborative albums ready to be released in the next few weeks, and my set from Southampton on this tour is in the middle of being mixed as a subscriber-only release. (head to stevelawson.bandcamp.com/subscribe for info on that). For now, PLEASE spread the word about these two tour-ending shows. 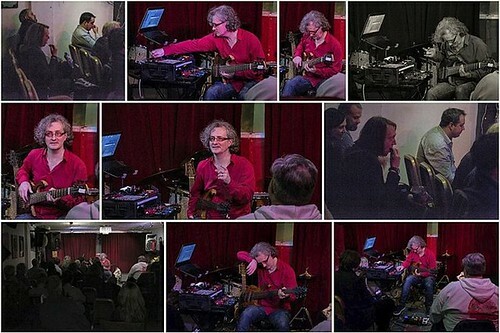 If you’re not nearby and want me to come and play near you, that has a WAY higher chance of happening if the rest of my gigs are well attended and create a bit of a buzz. Venues tend to notice that kind of thing. Here’s a link to some wonderful photos from the Southampton gig, by Aidan Hampson. A unique duo performance with drummer Andy Edwards – Andy was Robert Plant’s drummer for a number of years, and was also a member of Frost* & IQ, and currently plays with Quill and KIAMA. He’s brilliant and we’ve not done a duo gig for over two years. Illuminated Loops – after we debuted this project last year, we were inundated with people interested to see it and find out more about it. Poppy Porter is a visual artist and jeweller. She is synaesthetic meaning she has a visual response to sound, particularly music – she then captures what she sees on paper and in 3D in her extraordinary art-jewellery creations. In this project, I improvise, she reacts to what she sees in my music, and then I in turn respond to the visuals as a ‘graphic score’. This evolve and change in fascinating and beautiful ways, with some really surprising music and a chance for the audience to see the interaction merge and change before their eyes. Not to be missed!